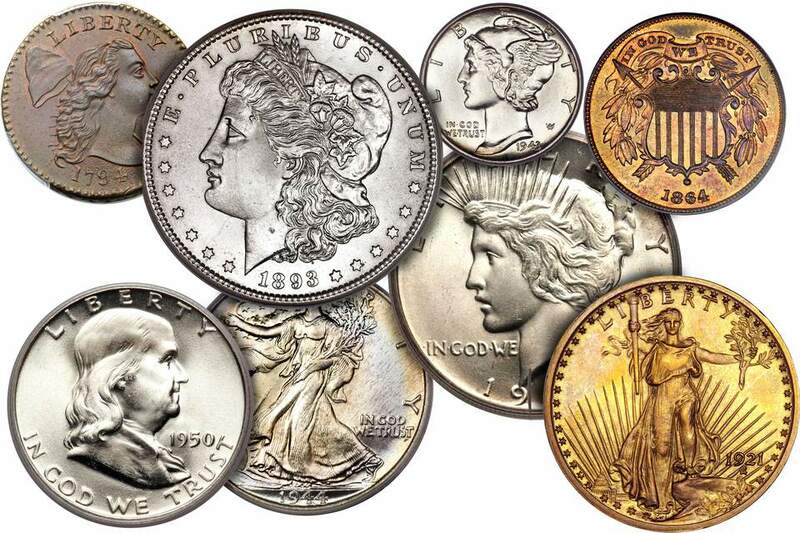 The most common question coin dealers are asked, "How much is my coin worth?" Several factors must be taken into consideration before we answer that question. If you are buying the coin, the value will be higher than if you are selling it. If the coin was used in commerce and appears to be circulated, it will be worth less than an unused coin in uncirculated condition. Find your coin below and click on the link to see how much your coin is worth. Find out how much your Indian Head Pennies are worth by using this table of coin values. 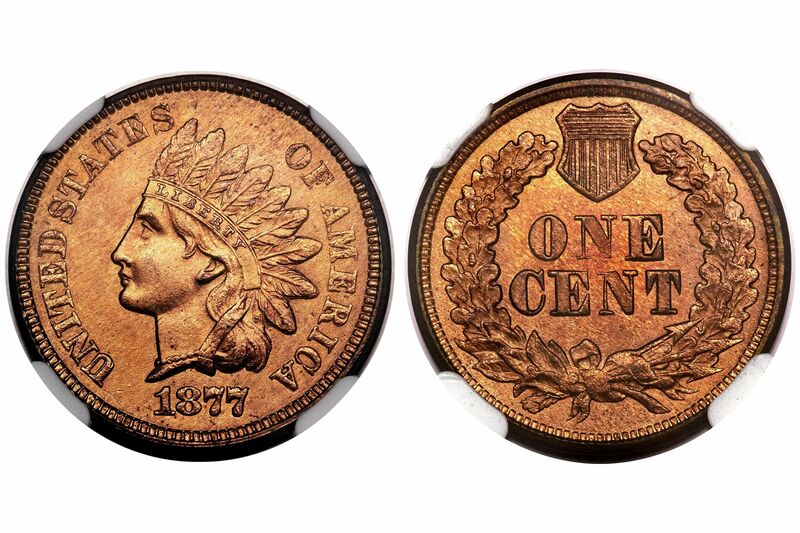 Indian head pennies were first made in 1859. The United States mint continued to make those pennies until 1909. The United States Mint made the first Lincoln Wheat penny in 1909. The coin dies for the Lincoln cent were not ready for production in January of 1909. Therefore, the mint continued to make Indian Head pennies until they were prepared to produce Lincoln pennies. Discover how much your Wheat Pennies are worth by using this table of coin values. A 1979 Lincoln Memorial Penny Minted at the Philadelphia Mint in Uncirculated Condition. In 1959, the United States Mint changed the reverse design of the Lincoln penny to featured the Lincoln Memorial. Frank Gasparro designed the Lincoln Memorial reverse to celebrate the 150th anniversary of Abraham Lincoln's birth. Learn what your Lincoln Memorial Pennies are worth by using this table of coin values. The United States Mint first produced a nickel five-cent coin in 1866. Previous to that, five-cent coins were made out of silver and were known as half dimes. The coin actually has more copper than nickel in it. The composition has been unchanged since 1866 and consists of 75% copper and 25% nickel. Even though there is more copper than nickel, the coin is silver in color. Look up the value of your Shield nickels in this price guide. Liberty Head or "V" nickels were first produced in 1883. Unfortunately, the United States Mint did not explicitly put the denomination on the coin. It was just a V for five on the reverse. This led to unscrupulous people gold plating the five-cent coin and turning it into a five dollar coin. Later that year, they added the word "CENTS" to the reverse of the coin. Coin values for all Liberty Head nickels are found on this price guide. And example of a buffalo or Indian head nickel. The United States Mint first produced Buffalo Nickels in 1913. This innovative design figured a portrait of a Native American Indian on the obverse and a rugged bison on the reverse. This ruddy design was an instant hit with the American people. Mercury or Winged Liberty Head Dime (1916-1945). The United States Mint first produced the Mercury dime in 1916. Adolf A. Weinman designed both the obverse and the reverse. Production continued until 1945 where it was replaced with the Roosevelt dime. See if you have the rare and expensive 1916-D Mercury dime! The United States Mint first produced Standing Liberty quarters in 1916. Herman A. MacNeil originally designed Lady Liberty with her right breast exposed. After about a year, the mint modified the design to cover Lady Liberty with a coat of chain mail. The official reason given by the mint was that lady liberty is prepared for war given that World War I had just begun. The mint created the Washington quarter as a commemorative coin to celebrate the 200th anniversary of the birth of our first president, George Washington. The following year, the Great Depression had set in, and there was not enough demand to dictate the production of any quarters in 1933. When production picked up again in 1934, the mint decided to keep this favorite design on our twenty-five cent coin. By 1965, the price of silver had risen to the point that 1/4 was worth more as scrap metal than its face value of twenty-five cents. To address this dilemma, the United States Mint changed the composition of the quarter from 90% silver and 10% copper to an alloy of copper and nickel. Although common, these coins are still widely collected by people across the country. By an act of Congress, the United States Mint started producing The 50 State Quarters in 1999. Every year five new quarters would be issued to feature a unique design on the reverse of the coin highlighting one of the fifty states. States were featured on the coins in the order that they joined the union. This coin program was the most popularly collected coin in the history of the United States Mint. The United States Mint began featuring Benjamin Franklin on the half dollar in 1948. This design replaced the classic design of theLiberty Walking half dollar. Franklin half dollars were produced until 1963 when the Kennedy half dollar replaced it. Although simple in design, this classic half dollar is a favorite amongst coin collectors. Use this value guide to find the current value of your Kennedy half dollars. The values presented in this guide are what you can expect a coin dealer to pay you for your coins. This easy to follow and understand guide will help you when you are ready to sell your coins. George T. Morgan designed the United States silver dollars that were first produced in 1878. His design was met with criticism and ridicule from the American public. People referred to the American Bald Eagle on the reverse as "the buzzard." The coins were big and bulky, and the American public referred to them as "cartwheels." By the 1970s Morgan silver dollars became one of the most widely collected coins from the United States Mint. In 1921, the United States was recovering from the effects of World War I. The American public was relieved that peace has returned to the globe. To celebrate this grand occasion, Anthony de Francisci created the Peace silver dollar. The obverse design is simple, yet dignified. The reverse features a majestic eagle facing towards the rays of the sun. The United States Mint attempted to replace the large and bulky one dollar coins with a small and compact coin design. Unfortunately, it was very similar in size and shape to the United States quarter. The obverse featured a stoic Susan B. Anthony. All these factors coupled together led to the demise of this experiment in small U.S. dollar coins. Trying to ride on the coattails of the hugely successful 50 State Quarters program, Congress ordered the United States Mint to produce a series of one dollar coins featuring each of the presidents of the United States. Four coins were issued every year until all presidents who have been deceased for at least two years were honored. United States Proof Sets are a great way to collect one of each circulating coin from The United States Mint. The mint has been issuing these coin sets regularly since 1936. Find out how much your proof sets are worth and how much would it cost you to assemble an entire collection. The United States Mint has been producing Modern Commemorative Silver Dollars since1983. These coins were made especially for coin collectors and did not circulate in everyday monetary transactions. learn the multitude of events and people commemorated on these collectible coins. The United States Mint annually produces sets of uncirculated coins for coin collectors. These include one of each coin made for circulation from both the Denver and the Philadelphia mint. These uncirculated coin sets were first produced in 1947 and are still being produced today. How Much Is My Classic Head Half Penny Worth?